Examples, videos, stories, and songs to help Grade 1 kids learn about CVC (Consonant-Vowel-Consonant) words. 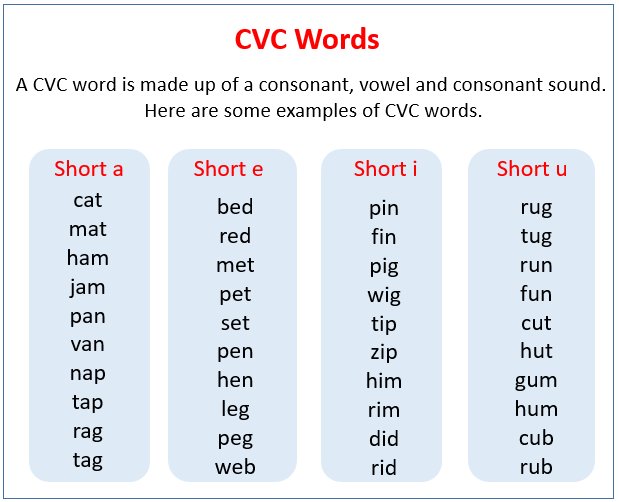 A CVC word is a word that is made up of a consonant, vowel and consonant sound. The following table gives some examples of CVC words. Scroll down the page for more examples and explanations. This video helps kids learn about words with "at" endings. This is a phonics reading video to help teach kids to read. You can turn the volume down and let your children make the sounds themselves, when they are ready.